Samuel Barclay Beckett (/ˈbɛkɪt/; 13 April 1906 – 22 December 1989) was an Irish avant-garde novelist, playwright, theatre director, and poet, who lived in Paris for most of his adult life and wrote in both English and French. He is widely regarded as among the most influential writers of the 20th century. Beckett's work offers a bleak, tragicomic outlook on human existence, often coupled with black comedy and gallows humour, and became increasingly minimalist in his later career. He is considered one of the last modernist writers, and one of the key figures in what Martin Esslin called the "Theatre of the Absurd". 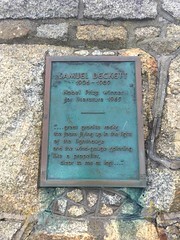 Beckett was awarded the 1969 Nobel Prize in Literature "for his writing, which—in new forms for the novel and drama—in the destitution of modern man acquires its elevation." He was elected Saoi of Aosdána in 1984. 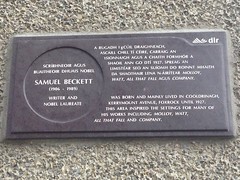 Samuel Beckett (1906 - 1989) Writer and Nobel Laureate was born and mainly lived in Cooldrinagh, Kerrymount Avenue, Foxrock until 1927. This area insporied the settings for many of his works including Molloy, Watt, All That Fall and Company. Samuel Beckett (1906 - 1989) Nobel Prize Winner for Literature 1969. "....great granite rocks the foam flying up in the light of the lighthouse and the wind gauge spinning like a propeller clear to me at last....".